These cufflinks unscrew to reveal a hidden message. We’ll engrave with three initials for no extra cost! 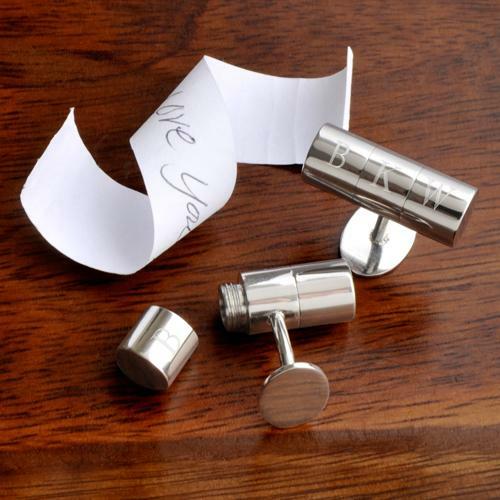 James Bond and Jason Bourne would love our Personalized Secret Agent Cufflinks! The unique set comes in a handsome gift box and includes a secret compartment that you can unscrew and hide a personal note in. This is the perfect bride to groom gift or an ideal thank you present for the groomsmen. Each cufflink measures 3/4" x 7/8" x 3/4". Gift boxed in a padded, black coffin-style case.